Miss Berry is pleading for help, due to the incessant drought. Ms. Peck returned the appeal letter with a $25 check. Possibly Mrs. Wm. Halsey-Peck. 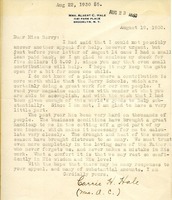 Mrs. Peck says that she has received Martha Berry's appeal but cannot send a check to help with the work of the school. She then tells her that the school will find other donors wishes her the best. Mrs. Parmly sends a $5.00 donation to the Berry Schools on behalf of Mrs. F.A. Freeland. 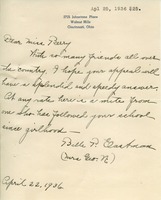 Mr. Elder writes to Martha to inform her that it is impossible to respond to her request even though he understands her need after the flood of Dayton in 1923. He says that the commercial losses have been phenomenal and they can barely hold on to their current employees, much less give charitable donations. 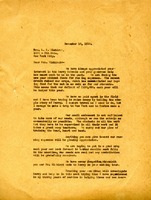 Letter from Martha Berry to the President of Eastman Kodak Company sending literature and requesting a donation of a Cine-Kodak Special camera. 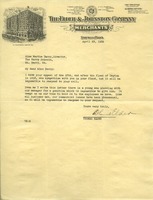 Note in answer to a friend appeal from Mrs R B Noyes with a $150 gift. 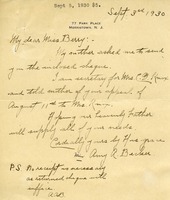 Miss Eager writes in reply to the appeal she received the previous day. Miss Eager sends a $25 gift. 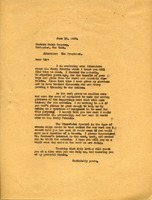 In this letter Martha Berry reaches out to Mrs. Woodruff to see if she will help donate to the Berry Schools to help get through the tough times. There is a stamp typed on the letter that signals that Mrs. Woodruff did donate twenty dollars.